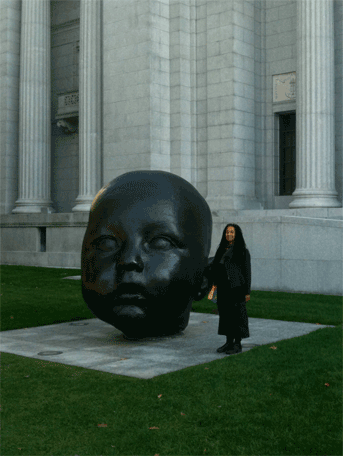 PZ with giant baby head in front of the MFA Bostion. What a season this has been! In a whirlwind of autumnal touring activity, I've been away more than I've been home. And, during my travels, I took advantage of Pro Tools’ new portability and did the lion’s share of creating and editing my track for Meredith Monk’s soon to be released Remix/Interpretations double CD. I did an interpretation of her Scared Song, and I’m pretty excited about how it came out. I’m equally excited about the great company I’ll be in on the compilation, which was curated by Paul Miller (AKA DJ Spooky, that Subliminal Kid) and will include tracks by a virtual who's who of new music notables including Bang on a Can, Björk, Don Byron, Vijay Iyer, Arto Lyndsay, Todd Reynolds, and Ryuichi Sakamoto, just to name a few. My fall adventures have been numerous. I’m afraid I made some big carbon footprints while criss-crossing the country a bit excessively. In September I led groups of enthusiastic participants through SoHo – performing impromptu works using the city as a score on my NYC "site reading" walks. There are a lot of nice photos on Elastic City's Flickr page (and I’ll also share a few of them with you here). The results were surprising and delightful. 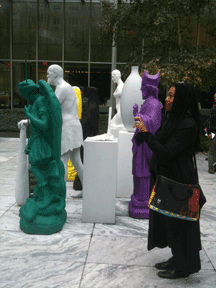 I also performed in an open rehearsal with Vijay Iyer & Mike Ladd at Harlem Stage, and took in the wild “Talk to Me” exhibition and the sublime DeKoonig retrospective at MoMA during that New York trip. I popped down to Louisville Kentucky briefly to present at the Idea Festival with Ruby Lerner and a small group of Creative Capital grantees before setting off for Colorado Springs to give a concert at the university there including solo works, structured improvisations with CU’s Electroacoustic Ensemble, an improv with Jane Rigler & Glen Whitehead, and a nice performance of my “50 (for Charles Amirkhanian)” with the choral group. 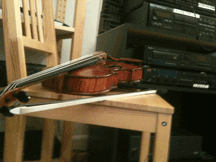 In October, I came home briefly and visited a Kronos Quartet rehearsal to watch them working with "K-Bows" and start thinking about plans for the peice I'll compose for them next year. 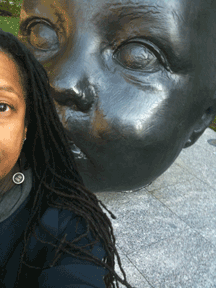 Then I left again to play a small gig in Baltimore where I also visited the famous American Visionary Art Museum. I then skipped over to Portland to perform in a festival of women in electronic music at Portland’s Dsjecta Gallery. I was there for a couple of days so I got to take in some nice performances by Heather Perkins & Cristi Denton (who organized the festival) as well as many other “Electrogals” (their word not mine...) that they managed to pack into the two concerts I saw – including a crazed and vachement superbe French songwriter called “Tender Forever”. Then, in November, I crossed back east again to give a concert at Wellesley college and meet with Elaine Buckholtz’ students in Boston at Mass Arts' Intermedia Department. While there, I had the great fortune of seeing about an hour and a half of Christian Marclay’s Clock, which currently has a lovely little screening room all its own at the Boston MFA. Suffice it to say that the piece is absolutely riveting. I would have watched it for 24 hours had that been possible. The amusing thing is, I had to leave at a certain time to go give a talk at Mass Arts and, at every moment, the piece itself was telling me how much more time I had before I had to go! In November, I did a visiting artist residency at Columbia College in Chicago, culminating with a concert in their new “Raw Space” black box. Then I went to Victoria BC to perform in the Voice++ Festival at Open Space Gallery. There I had the great pleasure of also hearing Nous Perçons Les Oreilles (Joane Hétu and Jean Derome) from Montréal. In late November, when I finally returned to San Francisco, I was really happy to be home, to sleep in my own bed, and to work in my own studio! Now with just one more 2011 event to go (a local Bay Area one), I can get down to the business of making new work, recording work, and seeing more work! This past week, I’ve filled up on some very beautiful art including Inkboat’s Line Between at ODC Theater and Pina Bausch Tanztheater’s Danzon at Zellerbach Hall. In my last public performance of the year, I’ll be performing solo in Berkeley on a shared evening with ROVA Saxaophone Quartet & The Manufacturing of Humdifiers! (Read onward for specifics...) For those of you in the Bay Area, I hope to see you there. And for all of you everywhere, I hope your winter holidays fill you with art, love, and delight! PZ performing "Memory Trace" at Columbia College in Chicago. Performing "Subway Map Floating on a New York Sidewalk"
PZ leading the group performing "Zweig!" PZ conducts "Magazine" text piece. Front row of subway sign chorus. Performing Flare Stains at Columbia. A giant baby looking over my shoulder. OFF highlights the best of the 1990's Bay Area creative music scene with a power packed line-up featuring: the Rova Saxophone Quartet playing a Tribute to Bay Area tenor saxophone great Glenn Spearman, local legend Ralph Carney, Pluto, Pamela Z, Gino Robair's Improvcore Orchestra 3000, Dan Plonsey's New Monsters, and a re-union of the avant jazz group The Manufacturing of Humidifiers, all in two action-packed nights. Curated by Steve Horowitz ("Super Size Me" and so much more) & part of the Berkeley Arts Festival, the OFF takes place on Friday, December 9th, and Saturday, December 10th, 8pm both nights. Admission is sliding scale, suggested donation $10-20. The Berkeley Arts Festival space is located at 2133 University Avenue, just off the corner of Shattuck, in beautiful Downtown Berkeley. January 20th, 2011 is the release date for MONK MIX (Remixes & Interpretations) - The Music of Meredith Monk. Produced by Paul Miller (aka DJ Spooky) this highly-anticipated double CD is a collection of tracks contributed by artists in the jazz, DJ, pop, rock and new music fields, all remixing or interpreting Meredith's music. Current artists include Bang on a Can, Björk/Brodsky Quartet, DJ Spooky, Don Byron, Sussan Deyhim, Miho Hatori (Cibo Matto), John Hollenbeck/Theo Bleckmann, Henry Grimes, Vijay Iyer, Rubin Kodheli, Lukas Ligeti/Pyrolator, Arto Lindsay, King Britt, High Priest (Anti-Pop Consortium), Matt Marks (Alarm Will Sound), Nico Muhly, Gabriel Prokofiev, Lee Ranaldo (Sonic Youth), DJ Rekha & RajStar, Todd Reynolds, Ryuichi Sakamoto, Scanner, Shodekeh, and Pamela Z.
Ms. Z and many of the other artists on the CD will perform live at the January 20th CD Release Party at Le Poisson Rouge, 158 Bleecker Street , NYC. 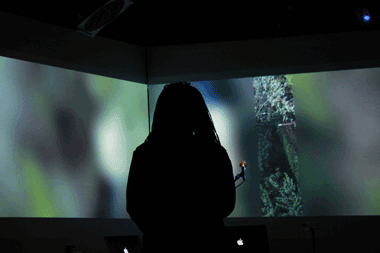 Pamela Z will give a solo performance of works for voice, electronics, and video as part of SmARTspace, an exhibition of art and technology presented by the Poetry Center in association with the Fine Arts Gallery at San Francisco State University in San Francisco, CA. 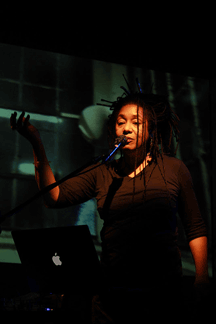 Pamela Z will give a solo performance of works for voice, electronics, and video as part of the Telfair Museums’ 2012 Pulse Art and Technology Festival at Telfair Museums’ Jepson Center at 6:00 pm in Savannah, GA.